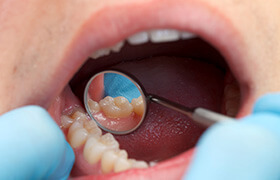 At some point in your life, you will likely need some kind of restorative dentistry care. Fillings, crowns, inlays, onlays…these are all common procedures used to increase the strength and function of your teeth when damage has occurred. The earlier we can intervene in the case of a cavity, infection, or dental injury, the more likely we are to achieve good results and save your teeth. If you’ve got a cavity, we will provide a dental filling. Left unabated, a cavity can eventually lead to serious infection and, even worse, the loss of a tooth. We use composite tooth-colored material to create cosmetic dental fillings when desired and possible. Porcelain crowns, inlays, and onlays provide extra strength and protection for teeth that have more extensive damage or are broken. We also offer root canal therapy. When an infection has reached the nerve that runs through your tooth root, root canal therapy removes the diseased nerve, cleanses the canal, and fills it to stop the infection. Oftentimes, root canal therapy can save teeth that might otherwise have been lost, keeping your smile in tip top shape. And if you need several restorative dentistry procedures in combination to bring your damaged smile back to life, Drs. Mauck and Ricci can perform a full-mouth reconstruction. 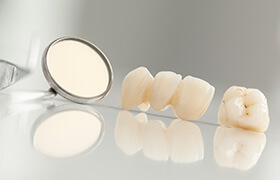 Dental crowns and bridges are two of the most reliable and trusted treatments in all of dentistry. A dental crown can be used to restore a broken, decayed, or misshapen tooth, which a bridge can be used to replace a single tooth or even a few in a row. To learn more, simply click on the link below. Dentures, in one form or another, have been used for generations to quickly and effectively replace multiple missing teeth. 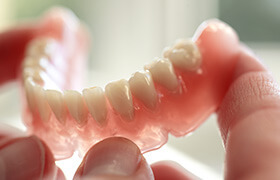 Now, modern-day dentures are smaller, sleeker, and more natural-looking than ever. They are made of prosthetic teeth attached to a natural-looking gum-colored base, and there are two main types. A partial denture is used to replace multiple missing teeth that are located throughout the mouth. They basically fit among the remaining teeth like the missing piece of a puzzle, and they are held in place using small metal clasps that attach to neighboring teeth. If you have an entire row of missing teeth, a full denture can be used to restore it. This sits directly on the gums and is held in place using natural suction and/or a small amount of denture adhesive. Root canal therapy is used to treat teeth that have damage or an infection deep within their innermost layer, which is known as the dental pulp. This pulp contains a number of things, such as the nerve of the tooth, which is why anything affecting it can cause so much pain. Despite its dubious reputation, root canal therapy is actually one of the best tools we have to relieve severe dental pain and save teeth that would otherwise need to be extracted. When you come in for root canal therapy, your dentist will start by thoroughly numbing the area to ensure your comfort. 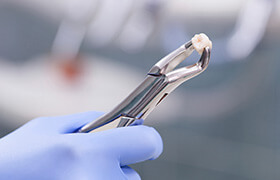 Then, they’ll create a small access hole to reach the pulp, remove the damaged tissue, clean the area, and then place a medicated packing into the tooth. At a follow-up appointment the tooth will be full restored using a dental crown. Room needs to be created for a partial or full denture. If you currently suffer from sleep apnea, we can provide you with simply, easy to use treatment using an approach called oral appliance therapy. For this, you’ll wear a custom-made mouthpiece to bed each night, and it will keep your airway open by slightly shifting your jaw forward. This treatment is much more comfortable than a traditional CPAP machine, and it can even be used to help those who want to stop snoring. If you’re one of the millions of people who is afraid of going to the dentist, don’t worry, you’re far from alone! If you need a little extra help to feel comfortable in the treatment chair, we can offer you two kinds of sedation. With nitrous oxide, you’ll simply need to breathe in an odorless gas, and within a minute, you’ll feel a warm, relaxing sensation come over you. 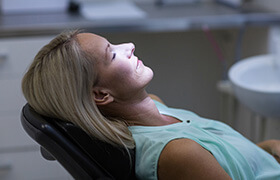 Or, if your nerves are a little stronger, we can offer you oral conscious sedation, in which you’ll take a pill before your appointment so that by the time you sit in the chair, you’ll be completely physically and mentally relaxed.